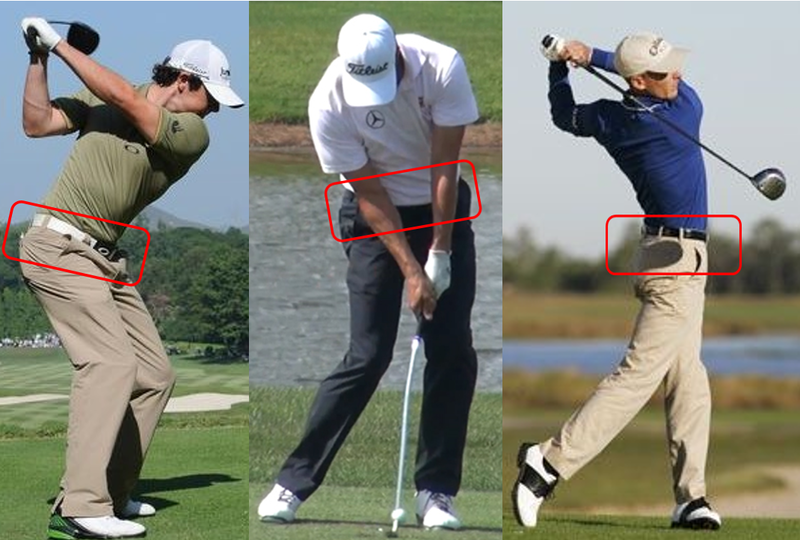 It hinges on the hips because good posture and a correct hip hinge at address is the foundation of a proper hip turn. The hips must counterbalance the forward-leaning upper body. If spine angle is to be maintained, the hips must stay back as they rotate, placing considerable demands upon the hamstrings and glutes to stabilize the pelvis. The sedentary nature of modern lifestyles means these muscles are notoriously weak in most people, so it is perhaps to be expected that a high percentage of golfers find it difficult to maintain spine angle throughout the swing. Without golf-specific conditioning, they will continue to do so. 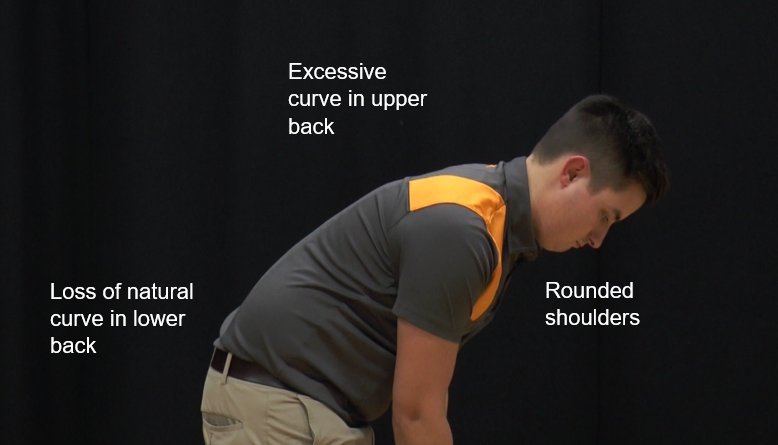 Many bring their everyday posture issues to their set-up, slumping in the upper back, rounding their shoulders as they move their hands in front of their chest to take their grip and tucking their chin on their chest to look down at the ball, which significantly restricts shoulder turn. They become disconnected from their ‘core’ muscles and then tend to initiate the downswing with their upper body, instead of their legs and hips, causing the dreaded over-the-top move and out-to-in swing path so regularly seen in higher handicap golfers. It is important that golfers know how their joints are designed to work, which muscles have a role to play in their respective functions, and whether they have the capacity to do their job effectively. The vertebrae in the low back are capable of only minimal rotatory movement and the lumbo-sacral joint, which attaches the lower back to the pelvis, is ‘fixed’, affording no capacity for movement at all. The "apparent" rotation of the pelvis during the backswing pivot is misleading, because the pelvis has no axis of rotation. Re-alignment of the pelvis is in fact caused by internal hip rotation and proper rotation of the lower body in the golf swing is dependent upon unrestricted range of motion in both hips. The goal is for joints to function properly, without compensations through the chain. Conditioning enables golfers to control the pelvis without using other segments to compensate. Unlike the shoulders, our hips do not have a single axis for rotation, since our pelvis is suspended over two legs. During the backswing, human anatomy dictates that the pelvis rotate over the trail hip, whilst in the downswing and follow-through, it must rotate over the lead hip, thereby requiring a transference of weight between the two. To initiate the takeaway, there needs to be a small lateral hip shift, just enough to move weight into the trail leg. The trail knee must stabilize the leg and make it a stable "post", that allows the trail hip to pivot above it. It must remain slightly flexed throughout the backswing and the hip adductors be properly activated to prevent the trail knee and hip from swaying, because weight can then move onto the outside of the trail foot and stability is lost. It can also cause pelvic tilt, with the trail side of the pelvis rising higher than the lead side, causing the lumbar spine to tilt along with it and the golfer ends up leaning towards the target (aka reverse spine angle, or reverse pivot). To a greater or lesser degree, the hips must move in all three planes during the golf swing and, ideally a golfer will have a full range of motion in all three planes. A restricted ability to rotate or flex the hips will typically lead to ‘lifting’ the club in the backswing. A lack of hip rotation and flexion typically sees the clubface open in relation to its plane, making it difficult to get the club back on plane and the face square in the downswing. Good players initiate their downswing with their powerful trunk and hip muscles. This transitional move – sometimes referred to as ‘the squat-to-square move’ – is a more obvious lateral shift of weight into the lead leg that effectively pulls the arms down ‘into the slot’. They should remain passive. In fact, well-conditioned professional golfers, with good upper/lower body separation, continue to elevate their arms as this transitional move of the lower body back towards the target begins. Conversely, higher handicap players, without the requisite levels of flexibility, typically use their hands and arms to power and guide the club right from the start. Increasing flexibility ought to be a priority for them. The lead hip is exposed to high-velocity internal rotation on the downswing, requiring great strength in the gluteus maximus and gluteus medius. Most golfers would benefit from conditioning exercises designed to strengthen these two muscles. Restricted internal rotation in the lead hip will affect ability to load around the lead leg through impact, so the pelvis will tend to move laterally – sliding target-wards and blocking the arms’ swing. The lead hip must be free to rotate significantly and clear itself as the lead leg posts up. This not only allows the arms room to swing freely, but also the trail side to ‘fire down and through’ into impact. If you suffer from a sway or slide in your golf swing and lack power, the first thing you need to do is assess your internal hip rotation. Pelvic obliquity theory suggests that the lead hip should be slightly higher that the trail hip at address, roughly level ‘at the top’ and significantly higher at impact – with the angle of the pelvis directly linked to clubhead speed at impact and consistently peaking immediately after impact among professional golfers. A golfer invariably knows what movements they are trying to make, so the brain will do everything it can to make them happen. However, if some of the body areas that ideally would be recruited are compromised because of postural issues, or physical limitations in terms of either strength or flexibility, as we’ve hopefully made clear, the body will enlist compensatory movements from another body part. Therefore, it is important for golfers who have serious game-improvement ambitions to assess their golf fitness levels and work on redressing any physical limitations, if they are to improve their game and reduce risk of injury.